When the temperature starts to change, you don’t want to have to worry about whether or not your HVAC system is working properly. 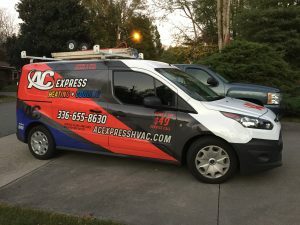 At AC Express Heating & Cooling, we are dedicated to ensuring that you and your loved ones are comfortable, so our team can help you by repairing or replacing a broken heat pump. What is a Heat Pump? How Does it Work? A heat pump is a mechanical device used in heating and cooling systems. It can be used to either heat or cool a controlled space. Installation consists of an indoor device called an air handler and an outdoor device similar to a central AC unit but properly referred to as a heat pump. This heat pump acts as a transporter of heat. It will move air from one area to another depending on what areas of the home or business need heat and which areas do not. The heat pump works by extracting heat from the air and either pumping the heat into an area that is cold or removing the heat from an area that is too warm. Heat Pumps transfer heat from one place to another and are an efficient and reliable means of heating and cooling. In addition, heat pumps are considered to be a green technology. The downside is that heat pumps can be overworked at times, especially if used as the primary heating source in very cold climates. These conditions can often lead to heat pump damage. Ductwork, condenser, and thermostat problems can also contribute to various heat pump issues. Make sure to contact a professional heat pump repair technician instead of attempting any repairs yourself. One of the greatest advantages of a heat pump is its efficiency. Rather than having to generate heat, the pump is able to move heat back and forth, making for a much more cost effective heating system. Call us today for more information on heat pumps and heat pump repairs. Our team is committed to providing you with the best HVAC services in the Clemmons & Winston Salem, NC area. We have the knowledge and experience to address your issues and concerns and provide you with the best services. If you are unsure whether or not you need a new heat pump, contact our team to discuss your situation and your budget. We won’t try to sell you products and services that you don’t need. Call us today to get started! Contact us for heat pump repairs in the Clemmons or Winston Salem, NC area!